Villa Gallo Nero is a 15th century stone tower and it is part of a characteristic, small, stone village in the heart of Chianti. The villa is on three levels, it has 5 bedrooms, each lovingly decorated with Italian linens, and 5 bathrooms, each with its own shower or bath. The Villa comfortably sleeps 10. This villa is located in the heart of Chianti, just 25 km from Siena and it is completely immersed among the pristine nature, between forests and olive groves. The village of Casanuova di Ama is comprised of a small cluster of houses surrounded by the vineyards of Casanuova di Ama, the wine and oil-producing farm of the marvelous Bencini family. Centered between the medieval towns of Radda and Gaiole in Chianti, Casanuova di Ama is an easy 1-hour drive to Florence and a mere 25 minutes to Siena. 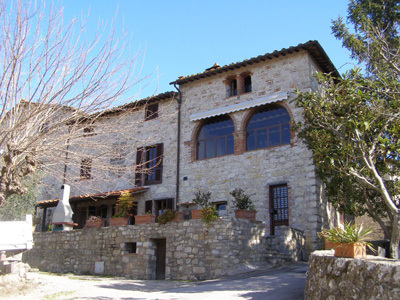 Lecchi in Chianti, distance 1,5 km.Groceries stores, church, restaurant, local wine and oil producers and vendors, supermarket. This pretty little hamlet is a few minutes drive from Lecchi in Chianti, a village which has a good restaurant, small shop and wine bar/cafe. Also nearby there is one of the five main Chianti towns, Radda in Chianti, which is the perfect place to spend an afternoon taking in the local atmosphere. This town has all amenities. Casanuova di Ama has excellent views from its hillside position. It is also ideally located in the beautiful countryside so that you can take many interesting walks through the vineyards and olive groves that surround the hamlet. Med Season: 22/Mar-17/May; 27/Sep-08/Nov; 13/Dec-27/Dec.